Sauerkraut adds the characteristic tang of a good rye bread without having to make a sourdough starter that can take days, if not weeks. It's moist and has a nice crisp crust. We used all-purpose flour in place of the bread flour and dark corn syrup in place of the molasses, and the recipe turned out well. 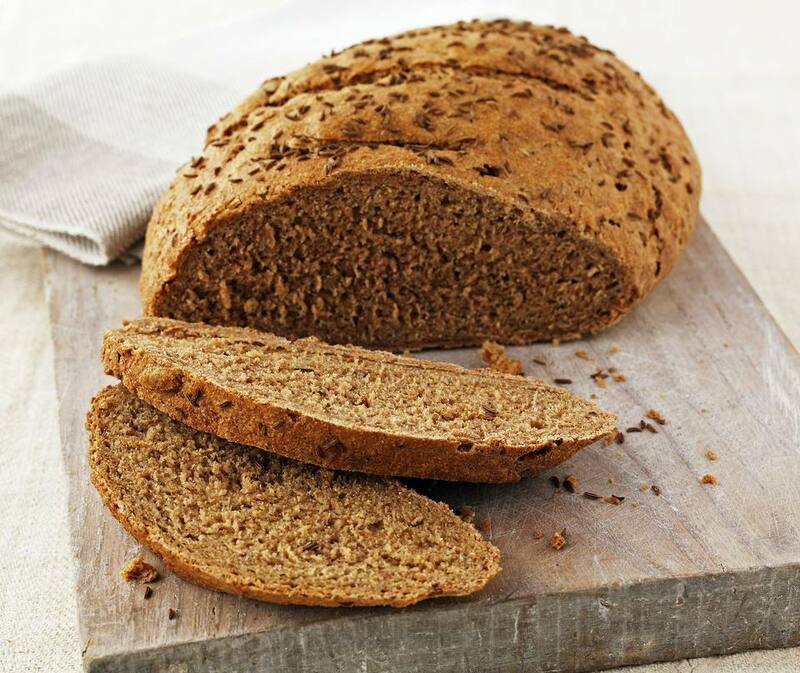 Rye bread is also great as an addition to recipes, even a few days later. In a larger bowl or a stand mixer, whisk together flours and yeast. In a separate bowl, mix together 3/4 cup warm water, butter, brown sugar, molasses, salt and caraway seeds. Transfer to bowl with flours and yeast, and mix slightly. Add sauerkraut and mix until a dough ball forms. Knead with the dough hook for 3 minutes, or 5 or more minutes by hand, to activate the gluten. Transfer to a greased bowl, cover and let rise until doubled in a warm place. This can take up to 2 hours or more. Coat a 9x5-inch loaf pan with cooking spray. Transfer dough to a lightly floured surface. Knead a few turns and flatten into a rectangle that is 10 inches wide. Roll up from one long side, pinch seams together, pinch ends together and place, seam-side down in the prepared loaf pan. Brush with oil or egg-water mixture. Cover with greased plastic wrap and let rise in a warm place until doubled. This can take up to 2 hours or more. Heat oven to 350 degrees and bake until an instant-read thermometer registers 190 degrees, 40 to 50 minutes, but begin checking at 30 minutes. Remove from oven and remove from loaf pan. Cool completely on a wire rack.